Encounter the luxury of the Gilded Age, historic architecture and world-class service at Palace Hotel, a Luxury Collection Hotel, San Francisco. Located in downtown San Francisco, our iconic, historic hotel features authentic elements paired with classically inspired, modern d cor. Relish our wealth of hotel services and amenities, from professional concierge assistance and valet parking, to in-room dining, scenic city views, a cutting-edge fitness center, meetings and event services and more. Our legendary hotel showcases two famous restaurants, with a distinctive setting for any occasion. Enjoy a leisurely dip in our heated, indoor pool with a sky-lit ceiling. Step outside our doors and explore downtown San Francisco, including Union Square, cable cars and Chinatown, just blocks away. Let us regale you with five-star service, extraordinary accommodations and deluxe amenities at the first luxury hotel in San Francisco, CA; as grand and trend-setting today as it was when we first opened our doors. The Garden Court Restaurant: Relish fine dining at Garden Court. 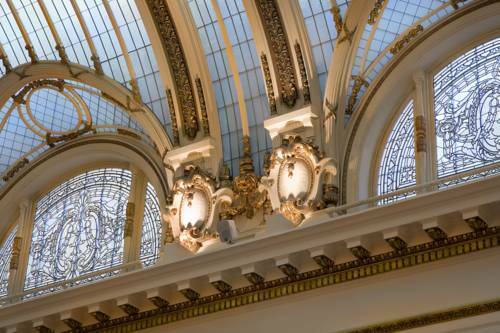 Our renowned hotel restaurant in downtown San Francisco is crowned by a glass dome atrium and shimmering Austrian crystal chandeliers. Enjoy our San Francisco Cuisine for Breakfast, Lunch, Signature Tea and City Brunch. The Pied Piper: Gather with friends or colleagues at The Pied Piper, our majestic hotel bar and restaurant named after the famous Maxfield Parrish painting that overlooks our sophisticated dining room. Enhance your casual dining experience with our signature cocktails. GC Lounge: The stylish GC Lounge is a vibrant, magical setting in a historic landmark. Meet and mingle or simply relax and indulge in luxury. Enjoy Tea Time in the afternoon or savory bites, signature cocktails, curated wines, and decadent desserts at night.